In life, things happen that make it difficult to always be upbeat and optimistic. Life wears us down and that is why we need tools to help us manage our well-being and happiness. We know that it is our birth right to be happy and to flourish optimally, but how do we actually attain that? Approximately 38% of individuals are suffering from depression, anxiety and other psychological illness which leaves a staggering 62% of people languishing. To languish means to be in a comfort zone and not achieve your full potential. Going through the daily motions called life but are not truly present, happy or fulfilled. Does this sound familiar? Then our tailor made Crafting Your Happiness Course is just what you need to move from just surviving to thriving. What Is Crafting Your Happiness About? Crafting Your Happiness is an interactive course that aims to stimulate your thoughts and offer practical skills which can shift unhelpful thinking patterns, actions and beliefs. Everybody starts at a different happiness level so this is very much your personal journey to craft, design and build your own happiness. As the word already indicates “crafting” refers to an action and involves developing skills, through which you can begin building a more positive and meaningful life. Crafting Your Happiness is built on the Science of Positive Psychology, the evidence based approach aimed at enhancing human happiness. Crafting Your Happiness is based on the science of Applied Positive Psychology which looks at the human being as a wholesome holistic person. Positive Psychology has sky rocketed over the years as it researches the practical elements of what matters most to us human beings; our emotions, our relationships, our purpose in life, our performance at work and how we attain our goals. 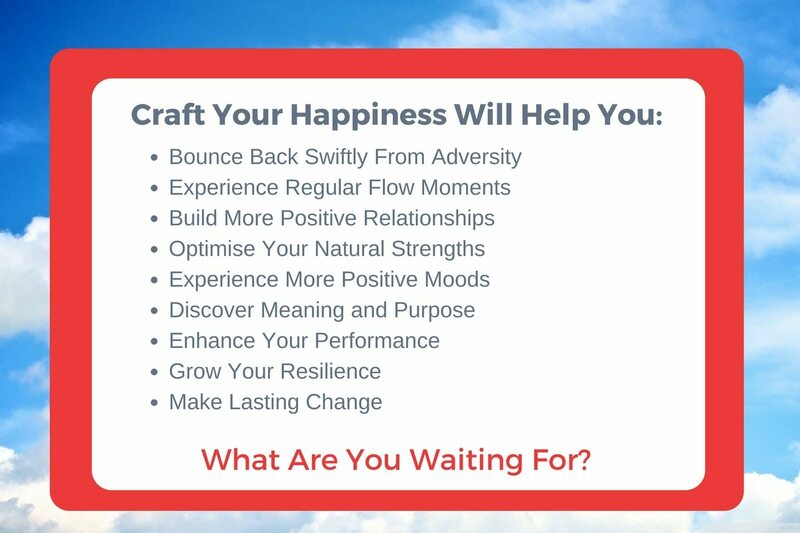 The Crafting Your Happiness course has been designed from this science, aiming to develop people’s understanding of how they can lead happy, healthy and fulfilling lives on an emotional, psychological, physical and social level. What makes Crafting Your Happiness powerful is that the tools, techniques and models discussed in the Foundation and Advanced Courses are all based on these robust scientifically researched techniques. A Pre Session Workbook – introducing the session topics and offering different evidence based surveys and questionnaire so you can explore your current state. Live Interactive Learning Sessions – on alternating Saturday mornings our expert facilitators will bring together theory, practice, reflection, and discussion in a four-hour supportive education environment, which includes a workbook, activities, self-reflective exercises and practical guidance. Enjoy the comfort of delicious food in a relaxed, private learning space at our specially selected venues. A Post Session Workbook – designed to help you apply what you learn in your daily life, our post session workbook offers highly practical, simple tools to start living the happy life you want. A Supportive Community – all our participants are proactive and caring individuals looking to make life more meaningful. Between sessions, we offer a private Facebook community where we can check in, support and inspire each other. Expert Facilitation and Coaching – our team at 4Seeds is passionate about empowering individuals to reach their potential. With years of experience in Positive Psychology, coaching, facilitation and health care, we are the guides to support you through this exciting and transformative journey. We recommend that you start with the Foundation Course to get a detailed and in depth understanding of the key principle components of what happiness is and what it isn’t. Keep an eye on our noticeboard for upcoming courses. The Crafting Your Happiness Foundation Course costs R3 300 per person. If you bring along a friend, partner, family member or loved one, you will receive 20% of the shared cost. The Crafting Your Happiness Advanced Course costs R4 500 per person, and our friend discount applies here as well! There are endless positive benefits to raising your happiness levels. It’s just like building and strengthening a muscle, it will need a plenty of patience, practice, disciple and self-love. Integrating the regular practices into your daily life will result in personal happiness mastery – the science has proved it! The important aspect to remember is that building your happiness muscle will grow your overall well-being. As Crafting Your Happiness looks at the human being as a holistic individual, the courses will cover the physical, psychological, emotional and social aspects of our well-being, thus uplifting all areas of life. Happiness is a choice, YOU are the only person who can make yourself happy. Everybody wants to be happy in life and you have the right as well as the choice to be exactly that. Happiness has been called the currency of fulfilment which makes it very attractive to own and possess. However, we forget that Happiness isn’t a goal or final destination to ever achieve or own. We are fooled into believing that if we have this or that we will be happy, and we may for a short period of time. However soon we become restless and unfulfilled once again. We equate happiness with smiley faces, joyful emotions, pleasure and gratification, but it’s nothing like that. Authentic happiness is a process and a life journey. It’s a conscious choice one makes and then starts moving toward, one conscious step at a time. Crafting Your Happiness will assist and support on that journey as well as ensure you stay on track. Positive Psychology is the applied scientific study of optimal human functioning and behaviour in individuals, communities and institutions. Psychology and Positive Psychology are both human social sciences that have the same fundamental purpose, but tackle it from different sides. Positive Psychology is the discipline of improving human well-being in our daily lives. One of Positive Psychology’s intentions is to generate evidence based practical interventions that people can learn and apply themselves to enhance their well-being. These interventions are shared freely and are relevant to all ages, creeds, religions, races and cultures. The major distinction between traditional mainstream psychology and Positive Psychology is that psychology focuses on the disease model and curing negative behaviours or psychological dysfunctions. This is an important role to fulfil because approximately 30% of the world population are psychologically unwell. So then, what about the remaining 70%? Who and how are they supported to flourish and experience their optimal level of well-being? In the 1980s, Professor Seligman became curious about who, how and what will support the majority of the population to flourish, prosper and live in a state of well-being. Positive Psychology does not intend to antagonise traditional psychology; however, it plays a vital role in us gaining a greater holistic understanding of the human condition. 50% of our happiness comes from our genetics, 10% is dependent on our circumstances, leaving the remaining 40% within our control. In a nutshell Positive Psychology’s emphasis is on healthy people that explore what is right versus what is wrong in their personal and professional lives. In Positive Psychology the focus is on raising people’s happiness set points, which enables us to cope better with and bounce back faster from traumatic events – something our world needs to learn more of. We will naturally still experience levels of emotional fluctuations, both positive and negative, but our ability to reset and move towards our happiness set point is simpler and faster. We manage not to remain in a negative state of emotions for too long. Positive Psychology can be traced as far back as the classical Greek philosophers around 4000 BC. After that it threads through Christianity, the Reformation and the Renaissance era right through to the 20th century philosophers of Jung, Rogers and Maslow. The mid 1950–1965 philosophers raised the importance of human dignity, growth, development and progress and began to shift from the current prevailing pessimistic psychoanalysis world view. It would be safe to say that Maslow (in his 1955 Humanistic credo) was ahead of his time when he touched on topics that have become extremely relevant in the current 21st century. Examples of these are: The importance of studying people at their worst and likewise at their best, studying humans as active, autonomous, self-governing beings, making psychology less intellectual and more mainstream, and creating a healthy culture and society in which man can grow and be self-fulfilled. At this point it must be said that Positive Psychology is not a westernised but rather a worldwide concept. It’s equally important in Eastern philosophies such as Buddhism, Fascism, Confucianism or Hinduism.